Over the last couple of years a wealth of new studies on Ancient Egyptian quarries has been published. There are overviews, investigations about technology and social organisation, case studies with a view to landscape archaeology and papers highlighting the acute conservation problems at many quarry sites. Here’s a very long update from 2007-2008 till today! Bloxam, Elizabeth. 2010. Quarrying and Mining (Stone). UCLA Encyclopedia of Egyptology. Full text and PDF. — This is the latest review, focusing on hard-stone quarries and mines/quarries for gemstone. The paper emphasises current research that is re-shaping ideas about use of stone tools and fire in extracting hard stones, transmission of stone-working technologies across deep time depths and the role of skilled kin-groups rather than large, unskilled labour forces in quarrying activities. Harrell, James, and Per Storemyr. 2009. Ancient Egyptian quarries – an illustrated overview. In QuarryScapes: Ancient stone quarry landscapes in the Eastern Mediterranean. Geological Survey of Norway Special Publication 12, ed. Nizar Abu-Jaber, Elizabeth Bloxam, Patrick Degryse, and Tom Heldal, 7-50. Trondheim: Geological Survey of Norway. PDF. 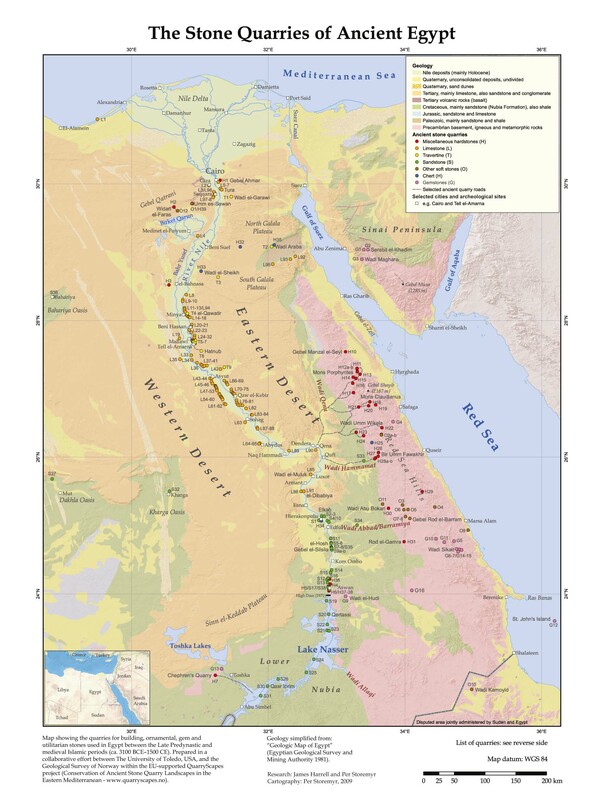 — The paper features the most up-to-date database on Ancient Egyptian quarries, including a new national map of all known sites (see below). There are also 35 mostly full-page illustrations and site maps. Geology, history of quarrying and several other issues are treated. Klemm, Rosemarie, and Dietrich Klemm. 2008. Stone and Stone Quarries in Ancient Egypt. London: British Museum Press. Google Books. — With less updates than one would have liked, this book is the English edition of the now classical “Steine und Steinbrüche im Alten Ägypten”, originally published in 1993. Bloxam, Elizabeth, Per Storemyr, and Tom Heldal. 2009. Hard stone quarrying in the Egyptian Old Kingdom (3rd millennium BC): Rethinking the social organisation. In ASMOSIA VII, Proceedings of the 7th International Conference of the Association for the Study of Marble and Other Stones in Antiquity, Thassos 15-20 September 2003. Bulletin de Correspondance Hellénique supplement 51, ed. Yannis Maniatis, 187-201. Further information. — Through an analysis of archaeological remains and comparing with quarrying in other contexts, it is suggested that Old Kingdom quarry expeditions, outside the Nile Valley, were small-scale campaign-driven operations involving specialists, well-organised through kinship ties and mobilised for specific projects. Bloxam, Elizabeth. 2009. New directions in identifying the significance of ancient quarry landscapes: Four concepts of landscape. 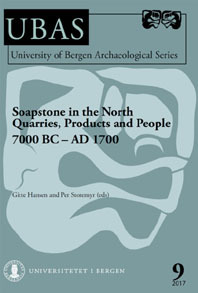 In QuarryScapes: Ancient stone quarry landscapes in the Eastern Mediterranean, Geological Survey of Norway Special Publication 12, ed. Nizar Abu-Jaber, Elizabeth Bloxam, Patrick Degryse, and Tom Heldal, 165-181. Trondheim: Geological Survey of Norway. Further information. — Articulating the significance of ancient quarry landscapes to a wider public is difficult, but essential if they are to be conserved and protected. Based on Egyptian case studies, this paper describes novel ways to determine values and how to view ancient quarries in a wider archaeological and present social context. Storemyr, Per. 2009. Whatever Else Happened to the Ancient Egyptian Quarries? An Essay on Their Destiny in Modern Times. In QuarryScapes. Ancient stone quarry landscapes in the Eastern Mediterranean. Geological Survey of Norway Special Publication 12, ed. Nizar Abu-Jaber, Elizabeth Bloxam, Patrick Degryse, and Tom Heldal, 105-124. Trondheim: Geological Survey of Norway. PDF. 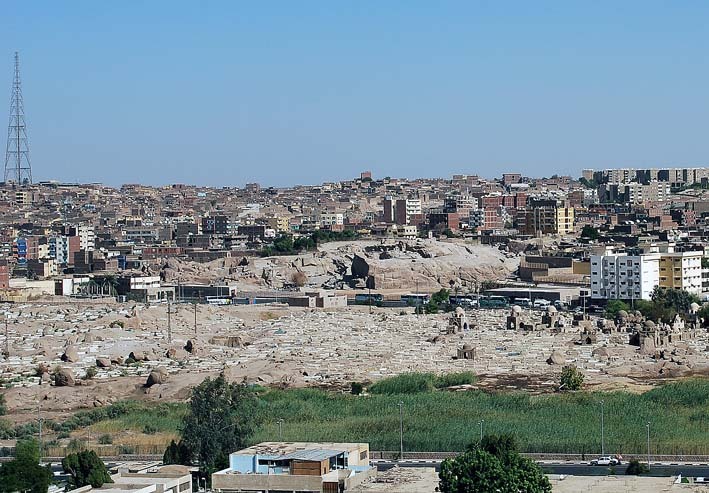 — This essay describes the fate of ancient Egyptian stone quarries over the last 50 years. It raises key conservation issues by focusing on the many-sided causes of destruction and neglect. These are mainly related to modern development, like urban growth and stone extraction, which are expected to remain the largest threat also in the future. Conservation efforts with positive effects in the Aswan region are highlighted. Bloxam, Elizabeth, and Tom Heldal. 2007. The industrial landscape of the Northern Faiyum Desert as a World Heritage Site: modelling the “outstanding universal value” of third millennium bc stone quarrying in Egypt. 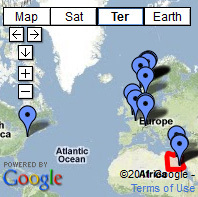 World Archaeology 39, 3, 305-323. Abstract/PDF. Based on cases studies of the basalt quarries of Widan el-Faras and gypsum quarries of Umm es-Sawan in the Northern Faiyum Desert, currently under nomination for World Heritage listing, this paper attempts to develop a methodology to articulate ‘outstanding universal value’ and to raise the significance of these production sites. 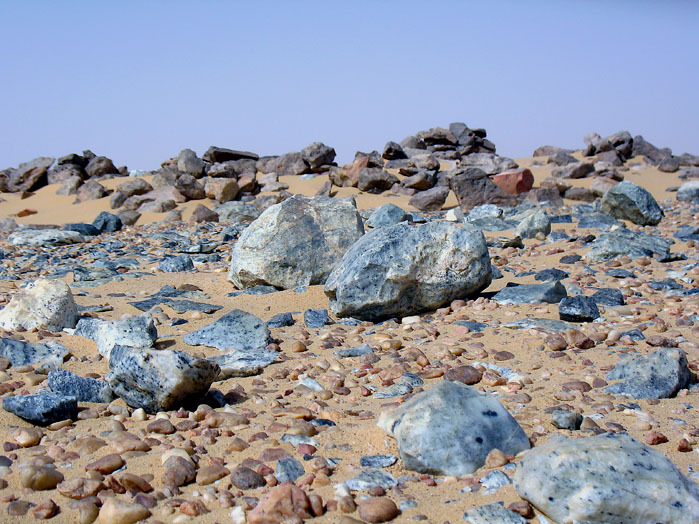 It argues for the cultural landscape of the Northern Faiyum authenticating one of the world’s oldest ‘industrial’ landscapes related to large-scale stone quarrying. Shaw, Ian, Elizabeth Bloxam, Tom Heldal, and Per Storemyr. 2010. 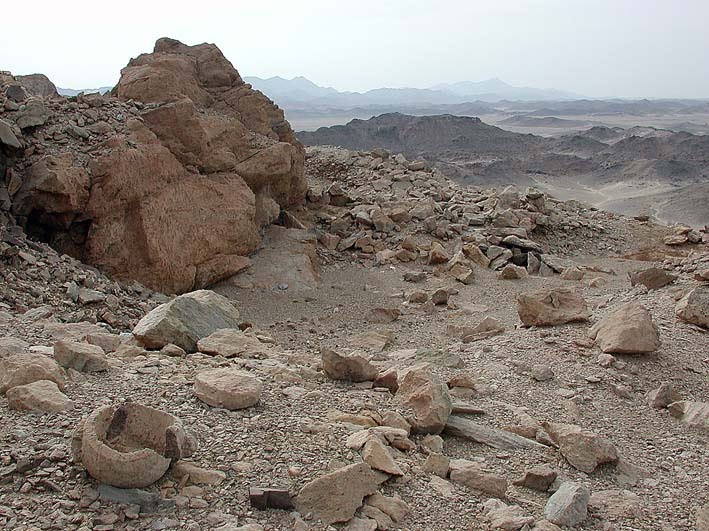 Quarrying and landscape at Gebel el-Asr in the Old and Middle Kingdoms. In Proceedings of the First Neapolitan Congress of Egyptology, ed. F. Raffaele, I. Incordino, and M. Nuzzollo, 200-218. Wiesbaden, Naples: Otto Harrassowitz. Full text/PDF. — After about 10 years of survey, this is a review of the most important findings as regards quarry sites, settlements and transport infrastructure at Chephren’s Quarry and Stele Ridge carnelian mine. The paper also focus on the acute threats to the site from the Toshka mega-scale irrigation project. Heldal, Tom, Per Storemyr, Elizabeth Bloxam, Ian Shaw, Richard Lee, and Abdou Salem. 2009. GPS and GIS Methodology in the Mapping of Chephren’s Quarry, Upper Egypt: A Significant Tool for Documentation and Interpretation of the Site. In ASMOSIA VII, Proceedings of the 7th International Conference of the Association for the Study of Marble and Other Stones in Antiquity, Thassos. 15-20 September 2003. Bulletin de Correspondance Hellénique supplement 51, ed. Yannis Maniatis, 227-241. Further information. — As a very extensive site in a flat desert region, Chephren’s Quarry is perfect to survey using GPS and GIS technology, also for determining modern threats. The methodology adapted is described and main results are highlighted, the latter including no less than about 700 small and medium stone extraction sites. Kelany, Adel, Mohamed Negem, Adel Tohami, and Tom Heldal. 2009. Granite quarry survey in the Aswan region, Egypt: shedding new light on ancient quarrying. In QuarryScapes: Ancient stone quarry landscapes in the Eastern Mediterranean. Geological Survey of Norway Special Publication 12, ed. Nizar Abu-Jaber, Elizabeth Bloxam, Patrick Degryse, and Tom Heldal, 87-98. Trondheim: Geological Survey of Norway. Further information. — Several new archaeological features have been found in the Aswan granite quarries. This paper details inscriptions, graffiti, unfinished objects, roads, transportation ramps and shelters. Also, boundaries of the remaining parts of the ancient quarry areas were drawn as a necessary step in planning for their immediate protection. What are dolphins doing on the quarried walls in the Aswan obelisk quarry? Kelany, Adel. 2009. Marks of the Quarry Workers at the Unfinished Obelisk Quarry, Aswan, Egypt: Preliminary Report. In Leukos lithos: Marbres et autres roches de la Méditerranée antique: études interdisciplinaires, ed. Philippe Jockey, 189-202. Paris: Maison méditerranéenne des sciences de l’homme/Maisonneuve & Larose. Further information. — During the recent large-scale excavations of the Unfinished Obelisk quarry in Aswan much graffiti was found. 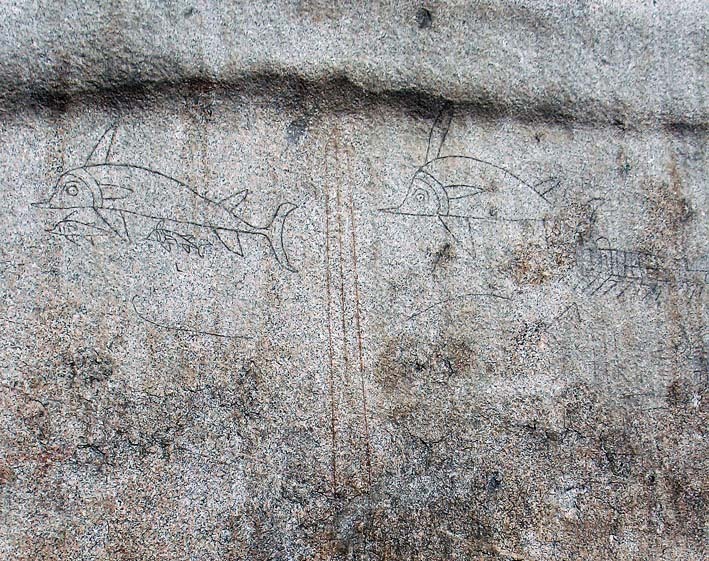 This paper reports new and old marks and drawings in the quarry. Of particular interest are hieratic dates, which suggest that work in the quarry was mainly done before inundation, certainly to be ready to transport objects away from the quarry during the annual Nile flood. Kelany, Adel, RR Parizek, Shelton S Alexander, David P Gold, Amr El-Gohary, KA Parizek, and Elizabeth J Walters. 2007. Canal Extension Confirmed by Geophysical Surveys, Aswan Obelisk Quarry, Aswan, Egypt. Bulletin of the Tethys Geological Society 2: 35-56. Further information. — Also part of the recent excavations of the Unfinished Obelisk quarry, this work reports the discovery of a rock-cut canal leading form the quarry to the Nile. This is a very important finding in relation to how obelisks were transported in the New Kingdom. Heldal, Tom. 2009. Constructing a quarry landscape from empirical data: General perspectives and a case study at the Aswan west bank, Egypt. In QuarryScapes: Ancient stone quarry landscapes in the Eastern Mediterranean. Geological Survey of Norway Special Publication 12, ed. Nizar Abu-Jaber, Elizabeth Bloxam, Patrick Degryse, and Tom Heldal, 125-154. Trondheim: Geological Survey of Norway. Further information. — The paper builds on survey data from the silicified sandstone quarries at the West Bank of Aswan. It suggests a method for grouping such data into five main elements: the stone resource, secondary resources, material remains from production, logistics and evidence of social infrastructure. These elements provide a basis for understanding different quarrying activities and time-layers. A pattern of several short or long-lived quarrying activities (or quarry complexes) is revealed. These can be viewed individually; each containing particular historical values, or collectively, as a rare landscape shaped by human engagement with a specific resource through several hundred thousand years. Bloxam, Elizabeth, Tom Heldal, and Per Storemyr (eds.). 2007. Characterisation of complex quarry landscapes; an example from the West Bank quarries, Aswan. QuarryScapes report. Trondheim: Geological Survey of Norway. Trondheim. PDF. — This is the main report of the QuarryScapes survey of the long-lived quarry landscape at the West Bank. Focusing on quarries and quarry infrastructure, the reports also details a wealth of other archaeological remains in the area. Shaw, Ian. 2010. Hatnub: Quarrying Travertine in Ancient Egypt. Excavation Memoir 88. London: Egypt Exploration Society. Further information. — This book presents results of fieldwork at the Hatnub travertine quarries between 1984 and 1990. It uses archaeological and textual evidence for addressing social and economic issues relating to ancient Egyptian procurement of materials from remote sites. Among the research questions are the provisioning and organization of Egyptian quarrying and mining expeditions, the nature of the key groups of workmen involved in quarrying, and the ritualisation of areas of remote, liminal human activity in the pharaonic period. Klemm, D, and R Klemm. 2009. Pharaonic limestone quarries in Wadi Nakhla and Deir Abu Hennis, Egypt. In ASMOSIA VII, Proceedings of the 7th International Conference of the Association for the Study of Marble and Other Stones in Antiquity, Thassos. 15-20 September 2003. Bulletin de Correspondance Hellénique supplement 51, ed. Yannis Maniatis, 211-225. Further information. — This paper describes the geology and archaeology of Wadi Nakhla by Deir el-Barsha with its huge limestone gallery quarries driven up to 250 m(!) into the bedrock. One of the many limestone layers were of particular interest for tomb construction and quarrying. Quarrying started in the Old Kingdom, it peaked in the in Middle Kingdom, galleries were reopened in the New Kingdom and quarrying peaked again in the Late Period. Adel Kelany surveying one of the hundreds of small depressions in Umm es-Sawan. No, its not old huts, but a grinding stone quarry! Heldal, Tom, Elizabeth Bloxam, Patrick Degryse, Per Storemyr, and Adel Kelany. 2009. Gypsum quarries in the northern Faiyum quarry landscape, Egypt: a geo-archaeological case study. In QuarryScapes: Ancient stone quarry landscapes in the Eastern Mediterranean. Geological Survey of Norway Special Publication 12, ed. Nizar Abu-Jaber, Elizabeth Bloxam, Patrick Degryse, and Tom Heldal, 51-66. Trondheim: Geological Survey of Norway. PDF. — The famous Old Kingdom gypsum quarries at Umm es-Sawan has been re-studied from a geoarchaeological perspective. Of the many interesting finds, the most important is that the so-called “hut-circle” area, formerly judged as a huge “encampment” for the quarrymen (Caton-Thompson & Gardner), was proven to represent a contemporary grinding stone quarry(! ), this bearing quite some implications for the interpretation of the social organisation of the gypsum quarrying. Storemyr, Per, Tom Heldal, Elizabeth Bloxam, and James Harrell. 2009. 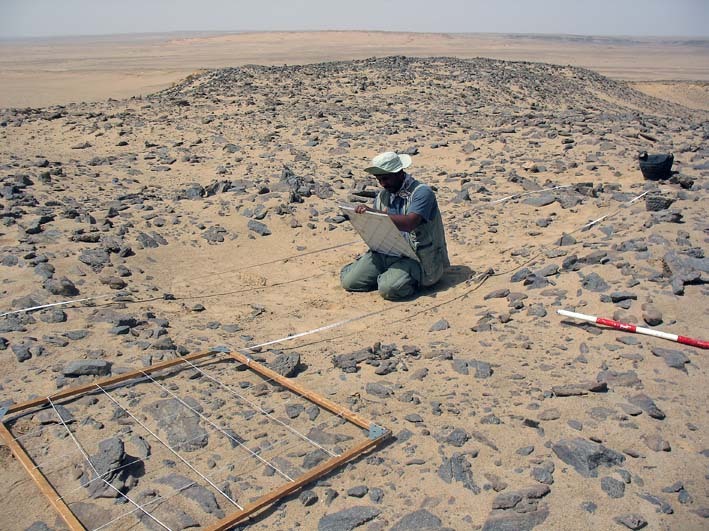 New Evidence of Small-Scale Roman Basalt Quarrying in Egypt: Widan el-Faras in the Northern Faiyum Desert and Tilal Sawda by El-Minya. In ASMOSIA VII, Proceedings of the 7th International Conference of the Association for the Study of Marble and Other Stones in Antiquity, Thassos 15-20 September 2003. Bulletin de Correspondance Hellénique supplement 51, ed. Yannis Maniatis, 243-256. Further information. 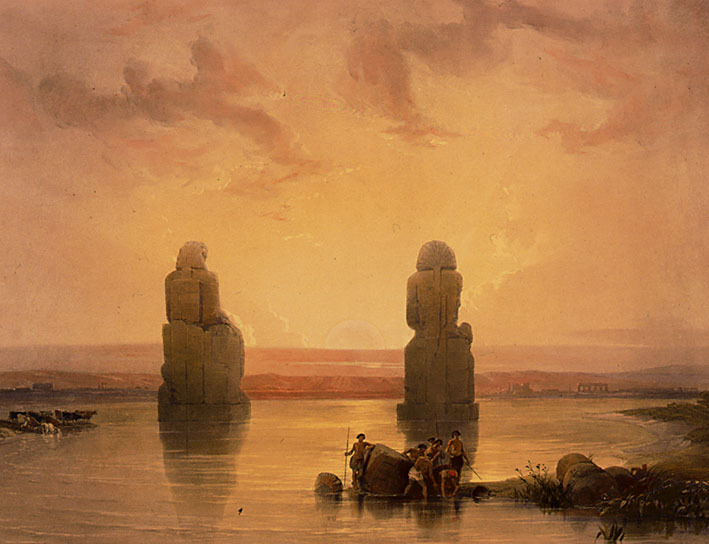 — Two small, previously unknown Roman basalt quarries in Egypt are discussed. One is within the Widan el-Faras Old Kingdom basalt quarry, the other is at Tilal Sawda near El-Bahnasa in Middle Egypt. Here, the Romans undertook very modest quarrying. Since Roman statuary may also have been worked from re-used Old Kingdom blocks remaining at the pyramid fields, it is not yet known whether the two quarries actually produced finished basalt objects. Welc, Fabian. (in press). The Third Dynasty open quarry west of the Netjerykhet pyramid complex. Étude at Travaux, Centre d`Archéologie Méditerranéene de l`Académie Polonaise des Sciences XXIV. — As to the provenance of the building stones for Djoser’s pyramid complex in Saqqara, this paper now confirms that they, at least partially, came from the immediate vicinity of the site. Excavations west of the complex have revealed several terraces with traces of stone quarrying. Harrell, James, and Elizabeth Bloxam. 2010. Egypt’s evening emeralds. Minerva 21, no. 6: 16-19. Further information. — This little article takes us on a wonderful trip to St. John’s or Zabargad Island in the Red Sea, where peridot was mined in the Graeco-Roman period (and later). Peridot is gem-quality olivine and this “quintessential desert island” the only known ancient source. The old workings and ruins of two small settlements were found and it is likely that the island was closely connected with Graeco-Roman Berenike, on the mainland 80 km to the northwest. Harrell, James, and V. Max Brown. 2008. Discovery of a Medieval Islamic Industry for Steatite Cooking Vessels in Egypt’s Eastern Desert. In New Approaches to Old Stones. Recent Studies of Ground Stone Artifacts, ed. Yorke M. Rowan and Jennie R. Ebeling, 41-65. London: Equinox. Further information. — Egypt’s old soapstone production has never before been properly investigated. But with this comprehensive paper, Harrell and Brown shows that production of vessels took place on a truly massive scale, especially in the medieval period. The use of soapstone is known from the Pharaonic period (e.g. statuettes) and there is ample evidence of quarry workings in the Roman period (vessels). In the Middle Ages (cooking) vessels were procured particularly in a large area to the northeast of Barramiya in the Eastern Desert. The industry was maintained by Bedouin tribes and vessels probably found their way both to the Nile Valley and across the Red Sea to Saudi Arabia. In some areas the industry lasted well into the 20th century. Harrell, James. 2009. The Bokari granodiorite quarry in Egyptʼs Eastern Desert. In ASMOSIA VII, Proceedings of the 7th International Conference of the Association for the Study of Marble and Other Stones in Antiquity, Thassos 15-20 September 2003. Bulletin de Correspondance Hellénique supplement 51, ed. Yannis Maniatis, 175-186. Further information. — This paper describes the recently discovered granodiorite quarry in Wadi Abu Bokari, within the well-known ancient gold mining area with the same name. The quarry consists of fifteen open-cut excavations that are scattered over an area of half a square kilometer. Within the quarry are four well-cut blocks that appear to be pedestals or trapezophori for supporting either stone basins or table tops. Other worked blocks, all rectangular, are found within the quarry as are also lines of pointillé pits and primitive wedge holes. Kelany, Adel, James Harrell, and V. Max Brown. 2010. Dolerite pounders: Petrology, sources and use. Journal of Lithic Technology 35, no. 2: 127-148. — This paper forwards the controversial idea that dolerite pounders used to quarry and dress granite and other hard rocks in Ancient Egypt were most efficiently used in their raw, angular state and not as the well-rounded objects that are recovered from excavations and surveys. The authors see the well-rounded pounders as discarded objects that no longer could be used. In order to avoid injury by handling angular objects, the proposal is made that the pounders were released just before impact on the rock to be carved away. These ideas will certainly lead to discussion! Kramer, Arris H. 2009. Talatat Shipping from Gebel el-Silsileh to Karnak. A Literature Survey. Bibliotheca Orientalis 66, no. 1-2: 5-20. Abstract/PDF. — This literature survey reviews current knowledge about the standardised building blocks used during Akhenaton’s times, the so-called talatats. Evidence of extraction at Gebel el-Silsila and Tell el-Amarna is described, as well as modes of shipping such blocks that weighs some 50-60 kg and can be handled by one man. Knox, R. W. OʼB, Rainer Stadelmann, James Harrell, Tom Heldal, and Hourig Sourouzian. 2009. Mineral fingerprinting of Egyptian siliceous sandstones and the quarry source of the Colossi of Memnon. 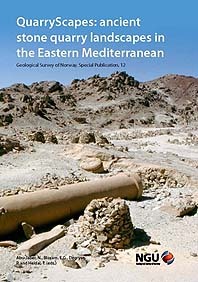 In QuarryScapes: Ancient stone quarry landscapes in the Eastern Mediterranean. Geological Survey of Norway Special Publication 12, 77-85. Trondheim: Geological Survey of Norway. Further information. — And at last; here’s the final word as to the provenance of the Colossi of Memnon: The two colossi that stood before the first pylon of the mortuary temple of Amenhotep III at are composed of single blocks of siliceous sandstone or quartzite, similar to that occurring in quarries near Cairo (Gebel Ahmar) and Aswan (Gebel Gulab–Gebel Tingar). Mineral fingerprinting, using the method of heavy-mineral analysis, points conclusively to a Gebel Ahmar source for the two Colossi. It also identifies Gebel Ahmar as the source for the two quartzite colossi associated with the second pylon and for fragments of quartzite statues that previously stood in the peristyle court. If you are interested in papers not available online, please send me an e-mail (per.storemyr@hotmail.com) and I may be able to forward a PDF or redirect you to the respective authors. I have only included the most relevant papers on a specific theme and not listed works that are better described in other works by the same author(s). If you have information about missing papers, please give me a hint! This entry was posted in Ancient Egypt, Archaeology, New publications, Old quarries and tagged Ancient Egypt, ancient egyptian quarries, quarry. Bookmark the permalink.